As a Member Association of the WCF, Curling Canada has decided to adopt this rule for its competitions, beginning this coming season. First, let’s be clear: no club player, team or league is obligated to play under the new rule; if you run the Tuesday night mixed league, you can keep the four-rock rule or establish a 10-rock rule if you want to. Do whatever you need to keep it fun and keep your members engaged and coming back for more. 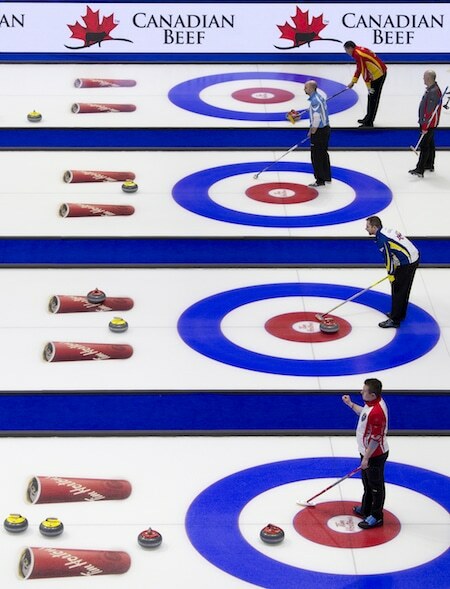 But if you enter any kind of a playdown that leads to a Curling Canada-operated championship, the five-rock rule will be in effect as of this coming season. As our sport advances and adjusts in all areas, most notably in athlete ability as well as rock and ice maintenance, the caretakers of the sport should never be hesitant to make adjustments that can improve the game. We should always cherish and value the history and traditions of curling, but never to the point that we are handcuffed to them. The inability to self-reflect and fine-tune when necessary is a downfall in many areas of life, and sport is no different. The five-rock FGZ has been tested and implemented for multiple seasons on the Grand Slam of Curling series, which has proven to be a vital testing ground to ensure that proposed changes make sense from both an athletic competition and fan excitement point of view. The athletes who competed under the five-rock FGZ almost universally thought this was a better way to showcase our sport. Five-rock FGZ allows for both teams to throw two guards that the other team can’t peel off immediately with their next shot. For instance, in situations where teams are tied in the last end, the goal is no different from the four-rock to the five-rock FGZ. The team with hammer is trying to score, and the team without hammer is trying to steal. The team with hammer can start peeling rocks with its second’s first stone, same as always. Similarly, for teams with hammer and a lead in the game, the strategy probably will not change. We don’t often see teams with hammer and a lead trying to throw two corner guards and taking the risk that they may give up a steal by ignoring other rocks in the middle of the house. So, there will still be ends that are similar in nature after the change this season. This is where we saw the biggest difference in five-rock-rule events. As mentioned earlier, the team without hammer cannot fully remove a rock with its second’s first stone, so when a team is down with hammer it has the ability to throw two corner guards that cannot be fully removed from play immediately. Often it means that the team without hammer keeps its first three stones in play. It changes the mindset on how teams defend big leads; do you play freezes or tapbacks in order to protect, or do you still attempt to throw the big-weight peels to try to clean up multiple rocks in play? What if you miss the first double peel and the team with hammer now has a rock frozen to yours and another one under a corner guard? In the parlance our sport, you’d say “you’re kinda in jail.” The opportunities and intricacies are endless and exciting for everyone. Teams will have to experiment to find what works best for them. How much risk are you willing to take on at various points in the game? How can your opposition force you to put more rocks in play, even when you may not want to that end? There is no one easy way to defend; some teams may still try to hit their way out of ends, and some may go to an offensively-defensive approach based on their skill sets. No strategy right now is thought to be best practice. Everyone including, juniors, seniors and our most elite teams, needs to work through the various ways that an end plays out to find out what works best for them. So sit back, relax and enjoy as the game continues to evolve and improve the way that we showcase our world-class athletes and their abilities.